And, of course, there’s Joe Biden, who is not running for president, (he is) apologizing if his behavior offended some of the women he touched inappropriately in the past. 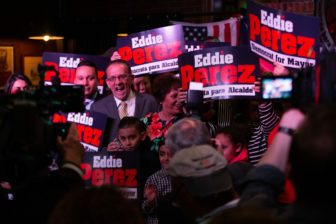 Reality was challenged no less in Connecticut, where former Hartford Mayor Eddie Perez, convicted of corruption in office nearly a decade ago, asked his fellow citizens to forgive him and return him to public office. Factual accuracy was not the chief concern of opponents to U.S. Rep. Jahana Hayes and her endorsement of the Green New Deal when they claimed that the non-binding resolution would cost the nation $93 trillion. Sometimes, though, numbers can be true – as when the Board of Regents for Higher Education says it may have to impose a 2.1 percent increase in tuition at the state’s 12 community colleges. Regrettably, the number of deaths caused by fentanyl has not fallen, and recently the deadly drug has been claiming as many African-Americans as it has whites. Here’s another large and more positive number: $100 million for the state’s public schools, money donated by hedge fund billionaire Ray Dalio’s philanthropic foundation. The private gift is to be matched with money raised from other philanthropies and state reserves, but the state’s use of public-private partnerships has been the source of some contentious exchanges between Republicans and Democrats. Of course $100 million is only a fraction of the $10.2 billion the Pentagon wants to build three Virginia-class submarines next fiscal year, instead of the traditional two-a-year . It is an additional expenditure that would benefit Groton-based shipbuilder Electric Boat.